Discover all the things you can do on the portal. As a new member you will get 50 Karma Points for free as a welcome gift! 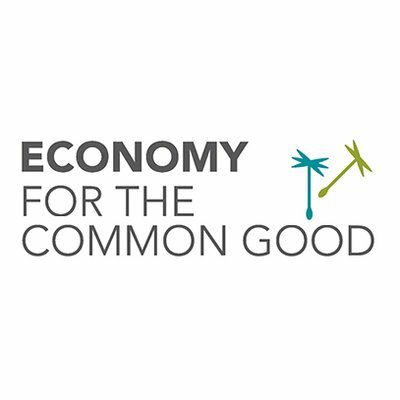 •Join our Community: Meet up and chat with lovely people, team up with social start-ups, NGOs, etc., but also with companies who like to do good. •Your personal profile: Reveal yourself as a ParticiPaider! 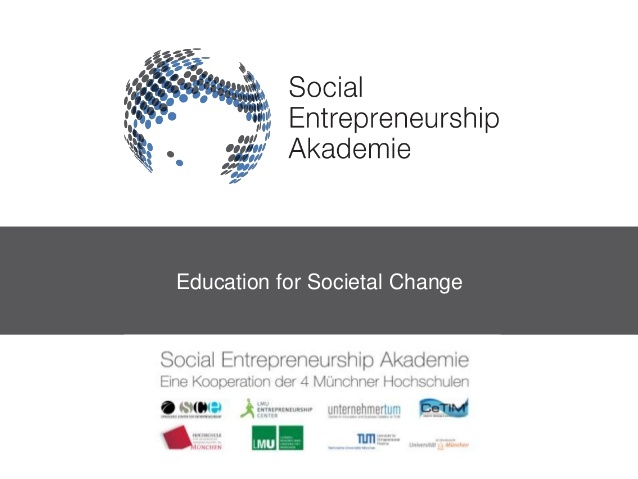 Show the social projects you like best and how you supported them. Display your “Badges of Honour” for all the good you did. If you want, you can also link your profile to your social media accounts (Facebook, LinkedIn, etc.). •Being matched: Choose what kind of do-good activities you are interested in and receive recommendations on social projects you might like to support. •Keep youself informed: Receive notifications from the projects you follow. You can also follow also project managers and your new friends on ParticiPaid. 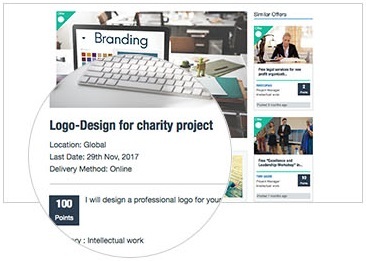 •Do good immediately and for free: Donate your free initial 50 Karma Points to your favourite projects (“Send Karma Points”). •Fulfill a need: Check out the projects and apply for a need you can fullfill (“Apply now”). •Help indirectly: Offer something, like second-hand items or your personal skills, on the Karma Shop (“Create an offer”). •Create double value with just one donation: Donate Karma Points you have received in exchange for fulfilling a need or in return for your offers on the Karma Shop (“Send Karma Points”). •Receive Karma Points: By fulfilling a project’s need you will be rewarded with Karma Points. •Enjoy the Karma Shop: Receive products and services you like in exchange for your Karma Points. 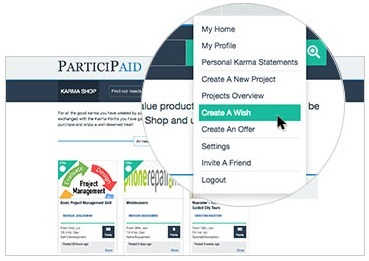 •	Voice your wish: You can even publish a “User Wish”, signaling what you would really like to receive on the Karma Shop (“Create a wish”). •Be honoured with Badges: For every project’ “Need” you fulfill, you will also be rewarded with a Badge of Honour” on your personal profile. Decide if you want to display your Badges on your Privacy settings. 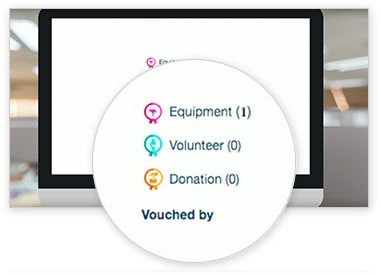 •Be vouched and followed by others: Other ParticiPaiders can follow your do-good activities and even vouch for you. Decide if you want to show your followers and vouches through your Privacy settings. 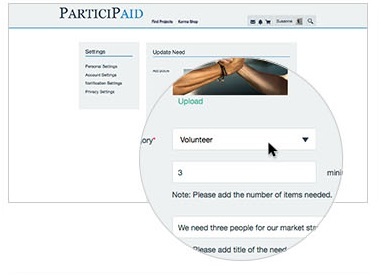 Receive support for your own do-good project or for your organization on ParticiPaid easily. •Promote your good case: Just sign up first and create a new Project. Describe your project and upload at least one picture. •Receive free Karma Points: All new projects will receive 250 Karma Points to get them started. 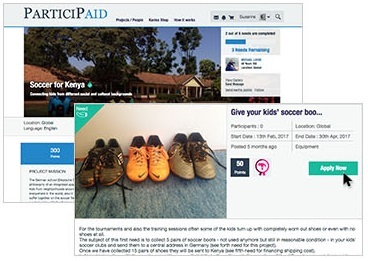 •Publish the Project’s Need(s): Projects have “Needs”, like receiving donations of money, equipment, or voluntary work. At least one Need must be published. Don’t forget to publish how many Karma Points and what Badge of Honour you will give to your contributors as a reward. 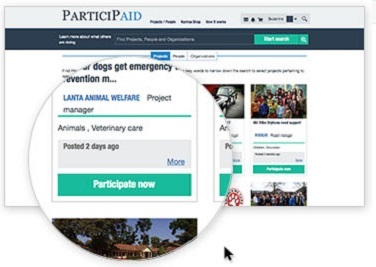 •Find new supporters: Get backed up by our community of do-gooders and invite your existing contributors to use ParticiPaid. •Send Karma Points: Reward your supporters for fulfilling a Need by sending them Karma Points. •Give Badges of honour: Honour your supporters with a Badge. •Get matched with others: If you are managing a private do-good project or if you are a member of a non-profit organization, please contact us. 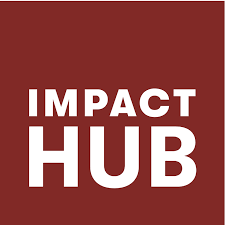 We can assist by matching you with other engaged ParticiPaiders, e. g. for producing an impactful film, designing a new website other great marketing stuff, receiving pro-bono legal advise, etc. •Exchange best practice: Meet your peers on ParticiPaid, see and exchange best practice, contacts, advice, etc. •Inform your supporters: Use the “Timeline”, the “Gallery”, your “Followers” and other great features on your profile and on the project page to update your supporters very easily and in real-time. •Gain trust and credibility: Being vouched by other ParticiPaiders, especially by notable non-profit organizations, will help you build trust for you and for your projects. Check out how our unique Karma Point System works. •Your welcome gift = 50 KP: Every new member receives 50 Karma Points for free. These initial KP should be donated to the social project(s) of your choice. •Invite a friend = 10 KP: For every of your friends’ successful registration, you receive another 10 Karma Points extra. 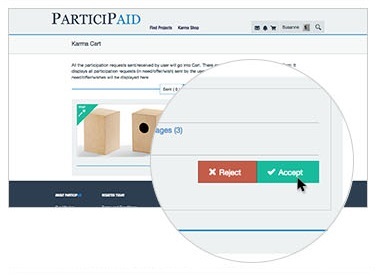 •Fulfill a need = get more KP: After completing a Project’s Need, you will be rewarded by the Project Manager with Karma Points and a Badge of Honour. Every published Need should indicate how many KP will be granted once fulfilled, and if a Badge will be given to to the ParticiPaider who applied. •Put an offer on the Karma Shop = get more KP: Offer your time, skills or items you don’t need any more to other ParticiPaiders in exchange for Karma Points. •Create your own project = 250 KP: Every new social project receives 250 Karma Points to start with. •KP donations from your supporters: Promote your social project and receive lots of Karma Points from others, e. g. their initial 50 KP. •Donate to a project: Spend your Karma Points on one or more projects. If you have received them as a reward for fulfilling a “Need” before, you will create even double value with just one donation. •Use them on the Karma Shop: Spend Karma Points for yourself and enjoy a well-deserved treat. You can also publish a “User wish” to ask for something that is not on the Karma Shop yet. •Save your Karma Points: You can also just save them on your “Personal Karma Point Statement” and spend them later. •Create your organizational profile: Present who you are and what you do – but also how you like doing good. Show your Badges of Honour for all the good you did. 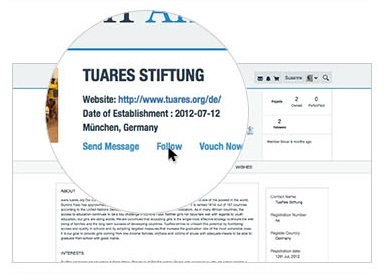 Link your profile to your website and to your social media activities (Facebook, LinkedIn, etc.). •Promote your products on our Karma Shop: Offer your products or services on our Karma Shop. 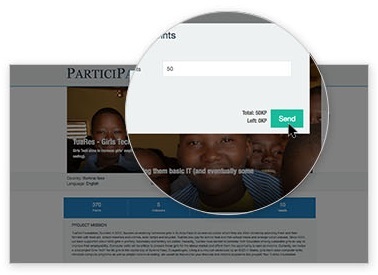 Receive Karma Points in return and donate those to social projects you like to support. •Corporate Social Responsibility (CSR): Find great projects and charitable organizations on ParticiPaid - or get matched with them. Let them become partners of your CSR activities or let us help you getting started doing good. •Team building and talent retention: Invite your staff or teammates to work together on one of the social projects on ParticiPaid. 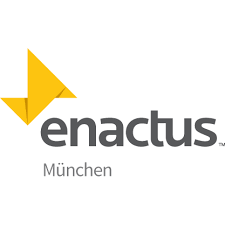 Please contact us if you would like us to assist you by matching your company/team with other ParticiPaiders, e. g. for organizing charitable team events and special team rewards. Do you want to maintain advanced search? ?